Picture - Stirling N6101 from No. 1651 Heavy Conversion Unit at Waterbeach, Cambridgeshire, being "bombed up." The Short Stirling was the first four-engined British heavy bomber of the Second World War. The Stirling was designed and built by Short Brothers to an Air Ministry specification from 1936, and entered service in 1941. 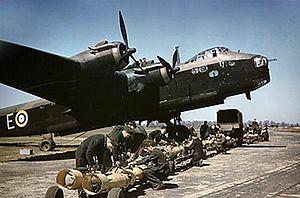 The Stirling had a relatively brief operational career as a bomber, being relegated to second line duties from 1943 onwards when other four-engined RAF bombers, specifically the Handley Page Halifax and Avro Lancaster, took over its role. Throughout the 1930s, the Royal Air Force was interested primarily in twin-engine bombers. These designs put limited demands on engine production and maintenance, both of which were already stretched with the introduction of so many new types into service. However, the limitations in terms of power were so serious that the British invested heavily in development of huge engines in the 2,000 horsepower (1,500 kW) class in order to improve performance. But in the late 1930s, none of these were ready for production. Meanwhile the U.S. and USSR were developing bombers with four smaller engines, which proved to have excellent range and fair lifting capacity, so in 1936 the RAF also decided to investigate the feasibility of the four-engined bomber. The Air Ministry Specification B.12/36 had a mixture of requirements. The bomb load was to be a maximum of 14,000 lb (6,350 kg) carried to a range of 2,000 miles (3218 km) or at reduced load 8,000 lb (3,629 kg) to 3,000 miles (4,800 km) (incredibly demanding for the era). It had to manage a cruise of 230 mph at 15,000 ft and fit 3 defensive gun turrets. The aircraft should also be able to be used as a troop transport for 24 soldiers. The idea was that it would fly troops to far corners of the British Empire and then support them with bombing. To help with this task as well as ease production, it needed to be able to be broken down into parts, for transport by train. Since it could be operating from limited "back country" airfields, it needed to lift off from a 500 ft (150 m) runway and able to clear 50 ft (15 m) trees at the end, a specification most small aircraft would have a problem with today. Initially left out of those asked to tender designs, Shorts were included because they already had similar designs in hand and they had ample design staff and production facilities. They were already producing several four-engined flying boat designs of the required size and created their S.29 design by removing the lower deck and boat hull of their S.25 Sunderland. The new S.29 design was largely identical otherwise: the wings and controls were the same, construction was identical and it even retained the slight upward bend at the rear of the fuselage, originally intended to keep the Sunderland's tail clear of sea spray. In October 1936, the S.29 was low down on the shortlist of designs considered and the Supermarine Type 317 was ordered in prototype form in January 1937. In February 1937 Shorts were asked to incorporate modifications to their design, including considering the Bristol Hercules engine instead of the Napier Dagger, increasing service ceiling (28,000 ft) and reducing the wingspan. Shorts accepted this large amount of redesign. The S.29 used the Sunderland's 114 ft (35 m) wing, and it had to be reduced to less than 100 ft (30 m), the same limit as that imposed on the P.13/36 designs (Handley Page Halifax and Avro Manchester). In order to get the needed lift from a shorter span and excess weight, the redesigned wing was thickened and reshaped. It is often said that the wingspan was limited to 100 ft so the aircraft would fit into existing hangars, "The wing span was limited by the Air Ministry to 100 ft" but the maximum hangar opening was 112 ft (34 m), and specification required outdoor servicing. In June the S.29 was accepted as the second string for the Supermarine 316 and formally ordered in October. Shorts built a half scale version as the S.31 (also known internally as the M4 - the designation on the tailfin), powered by four Pobjoy Niagara engines, which first flew on 19 September 1938, piloted by Shorts' Chief Test Pilot J. Lankester Parker. Everyone was happy with the design, except that the takeoff run was thought to be too long. Fixing this required the angle of the wing to be increased for takeoff, normally meaning the aircraft would be flying nose down while cruising (as in the Armstrong Whitworth Whitley). Instead, Shorts lengthened the undercarriage struts to tilt the nose up on take-off, leading to its spindly gear which in turn contributed to many takeoff and landing accidents. The Short S.31 was scrapped after a takeoff accident at RAF Stradishall, Suffolk in February 1944. 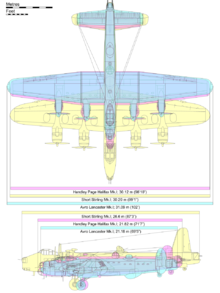 Picture - Diagram comparing the Stirling (yellow) with its contemporaries; the Avro Lancaster (blue) and the Handley Page Halifax (pink). The first S.29, now given the official name "Stirling" after the Scottish city of the same name, flew on 14 May 1939 with four Bristol Hercules II radial engines. Upon landing one of the brakes locked, causing it to slew off the runway and collapse the landing gear. A redesign added much stronger and heavier struts on the second prototype. On its first mission, two months later, one of the engines failed on takeoff, but the aircraft landed easily. From then on, the record improved and service production started in August 1940 at Shorts' Rochester factory. The area, which included a number of major aviation firms, was heavily bombed in the opening days of the Battle of Britain, including one famous low-level raid by a group of Dornier Do 17s. A number of completed Stirlings were destroyed on the ground and the factories were heavily damaged, setting back production by almost a year. Some production was relocated to Austin Aero's factory at Cofton Hackett just south of Birmingham and the factory there eventually produced nearly 150 Stirlings. In 1940, bombing damaged Supermarine's factory at Woolston and the incomplete Type 316 prototypes. The 316 was cancelled in November 1940 leaving the Stirling as the only B.12/36 design. The design mounted nose and tail turrets (the latter was notable for the wide angles of fire), and included a retractable ventral ("dustbin") turret just behind the bomb-bay. This proved almost useless due to cramped conditions, with the added distraction that the turret tended to drop and hit the ground when taxiing over bumps. It was removed almost from the start and temporarily replaced by beam hatches mounting pairs of machine guns, until a twin-gun dorsal turret could be provided. However, this installation also had problems; it had a metal back fitted with an escape hatch which turned out to be almost impossible to use. The later Stirling Mk.III instead used a fully glazed turret (the same FN.50 as in Lancaster) that had more room and an improved view. Later Stirlings could also carry an improved, low-drag remotely controlled FN.64 ventral turret. Attention was paid to reducing drag - all rivets were flush headed and panels joggled to avoid edges - but the application of camouflage paint probably negated the benefit. The wing was fitted with Gouge flaps similar to those of the flying boats. The first few Mk.Is received the Hercules II engines, but the majority received the 1,500 hp (1,100 kW) Hercules XIs. The Mk.III, introduced in 1943, was similar with the exception of the new dorsal turret and the improved 1,635 hp (1,200 kW) Hercules VI or XVI engines, which improved maximum speed from 255 to 270 mph (410 to 435 km/h). Even before the Stirling went into production, Short had improved on the initial design with the S.34 in an effort to meet requirement B.1/39. It would have been powered by four Bristol Hercules 17 SM engines, optimised for high-altitude flight. The new design featured longer span wings and a revised fuselage able to carry dorsal and ventral power-operated turrets each fitted with four 20 mm Hispano cannon. However, despite the obvious gains in performance and capability, the Air Ministry was not interested. In 1941, Short proposed an improved version of the Stirling, optimistically called "The Super Stirling" in the company's annals. This Stirling would feature a wing span of 135 ft 9 in (41.38 m), and a powerplant of four Bristol Centaurus radials and a maximum takeoff weight of 104,000 lb (47,174 kg). The performance estimates included 300 mph (483 km/h) speed and a 4,000 mile (6,437 km) range with a weapons load of 10,000 lb (4,536 kg). 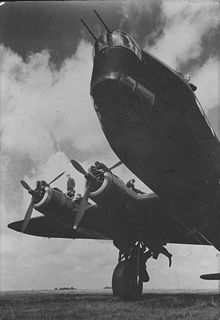 It was initially accepted for consideration under Specification B.8/41 but the C-in-C of Bomber Command Arthur Harris felt that, while it would be a better aircraft, actual production would be slower and that effort would be better spent on giving the Stirling improved Hercules engines for a higher ceiling. The project was cancelled shortly after. Operational status was not reached until January 1941, by No. 7 Squadron RAF. The first three Stirlings flew a mission on the night of 10/11 February 1941 against fuel storage tanks at Vlaardingen, near Rotterdam, and from spring of 1942 the bomber started to be used in greater numbers. From May 1943, air raids on Germany started with over a hundred Stirlings at once. Despite the "disappointing performance" at maximum altitude, Stirling pilots were delighted to discover that, due to the thick wing, they could out-turn the Ju 88 and Bf 110 nightfighters they faced. Its handling was much better than that of the Halifax and some preferred it to the Lancaster. Based on its flight characteristics, Pilot Murray Peden of No. 214 RAF Squadron flatly described the Stirling as "one of the finest aircraft ever built". Another consequence of the thick wing however was a low ceiling and many missions were flown as low as 12,000 ft (4,000 m). This was a disadvantage on many raids, notably if crews were attacking Italy and had to fly through (rather than "over") the Alps. When Stirlings were on combined operations with other RAF bombers which could fly at higher altitudes, the Luftwaffe concentrated on the low-flying Stirlings. Within five months of being introduced, 67 out of the 84 aircraft delivered had been lost to enemy action or written off after crashes. 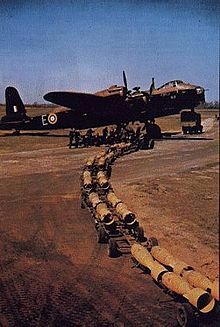 The Stirling's maximum bomb load was only able to be carried for relatively short distances of around 590 miles. On typical missions deep into Germany or Italy a smaller 3,500 lb (1,590 kg) load was carried, consisting of seven 500 lb (227 kg) GP bombs. This was the sort of load being carried by the RAF's medium bombers such as the Vickers Wellington and, by 1944, by the de Havilland Mosquito. Perhaps the biggest problem with the design was that although the bomb bay was large at 40 ft long (12 m) it had two structural dividers running down the middle, limiting it to carrying nothing larger than the 2,000 lb (907 kg) bomb. As the RAF started using the 4000-lb (1,815 kg) "cookies" and even larger "specials," the Stirling became less useful. The Handley-Page Halifax and especially the Avro Lancaster offered better performance (the Lancaster could carry twice the Stirling's bombload over long distances, and was at least 40 mph faster while having an operating altitude of about 4,000 ft higher), so when they became available in greater numbers from 1943, it was decided to withdraw Stirlings to secondary tasks. By December 1943 Stirlings were being withdrawn from frontline service as bombers, increasingly being used for deploying mines outside German ports, electronic countermeasures and dropping spies deep behind enemy lines at night (through the now unused ventral turret ring). Also at that time, there arose a need for powerful aircraft to tow heavy transport gliders such as the GAL Hamilcar and Airspeed Horsa; the Stirling fitted this role admirably. In late 1943, 143 Mk.III bombers were rebuilt to the new Mk.IV series specification (without nose and dorsal turrets), for towing gliders and dropping paratroops, as well as 461 new Mk.IVs being produced. They were used in the Battle of Normandy and Operation Market Garden. Stirlings were also used on Operation Glimmer on D-Day June 1944 for the precision-laying of patterns of "window" ("chaff") to produce radar images of a decoy invasion fleet. From late 1944, 160 of the special transport variant Mk V were built, which had the tail turret removed and a new opening nose added, most of these being completed after the war. In service with Bomber Command Stirlings flew 14,500 operations, dropping 27,000 tons of bombs, losing 582 in action with 119 written off. The Stirling is listed in the appendix to the novel KG 200 as one flown by the German secret operations unit KG 200, which tested, evaluated and sometimes clandestinely operated captured enemy aircraft during World War II. Two awards of the Victoria Cross, both posthumous, were made to Stirling pilots. Flight Sergeant Rawdon Hume Middleton of the Royal Australian Air Force the pilot-in-command of a No. 149 Squadron RAF Stirling Mk.I was awarded his VC for valour during a raid on Turin in November 1942. Acting Flight Sergeant Arthur Louis Aaron, the captain of a No. 218 Squadron RAF Stirling was awarded his VC for valour during a raid on Turin in August 1943. Barnes, C.F. Shorts Aircraft since 1900. London: Putnam, 1967. Bashow, David L. No Prouder Place: Canadians and the Bomber Command Experience 1939-1945. St. Catharine's, Ontario: Vanwell Publishing Limited, 2005. ISBN 1-55125-098-5. Bowyer, Michael J.F.The Stirling Story. Manchester, UK: Cr�cy Publishing Ltd., 2002. ISBN 0-947554-91-2. Buttler, Tony. British Secret Projects Fighters & Bombers, 1935-1950. London: Midland Counties Publications, 2004. ISBN 978-1-85780-179-8. Falconer, Jonathan. Stirling at War. Shepperton, Surrey, UK: Ian Allan Ltd., 1991. ISBN 0-7110-2022-1. "First Details of Great Britain's Biggest Bomber: A Four-engined Type with Fighter Manceuvreability." Flight, January 1942. Retrieved: 16 February 2010. Falconer, Jonathan. Stirling in Combat. Stroud, Gloucestershire, UK: Sutton Publishing Ltd., 1995. ISBN 0-7509-4114-6. Gomersall, Bryce. The Stirling File. Tonbridge, Kent, UK: Air Britain Ltd. and Aviation Archaeologists Publications, 1979. ISBN 0-85130-072-3. Goulding, James and Philip Moyes. RAF Bomber Command and its Aircraft, 1941-1945. Shepperton, Surrey, UK: Ian Allan Ltd., 1978. ISBN 0-7110-0788-8. Green, William and Gordon Swanborough. "The Ten Long Years of the Short Stirling". Air Enthusiast, Issue 10, July-September 1979. Bromley, Kent UK: Pilot Press, pp. 42-50. Green, William and Gordon Swanborough. WW2 Aircraft Fact Files: RAF Bombers, part 2. London: Jane's, 1981. ISBN 0-7106-0118-2. Hall, Alan W. Short Stirling, Warpaint Series No.15. Milton Keynes, Buckinghamshire, UK: Hall Park Books, 1998. No ISBN. Mackay, Ron. Short Stirling in Action, Aircraft Number 96. Carrollton, TX: Squadron/Signal Publications Inc., 1989. ISBN 0-89747-228-4. Mondey, David. British Aircraft of World War II. London: Chartwell Books Inc., 1994. ISBN 0-7858-0146-4. Peden, Murray. A Thousand Shall Fall. Stittsville, Ontario: Canada's Wings Inc., 1979. ISBN 0-920002-07-2. Short Stirling Remembered, Air History Series No. 1. Kidlington, Oxford, UK: Wingspan Publications, 1974. ISBN 0-903456-03-8.